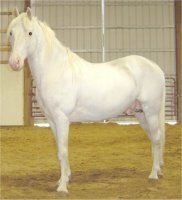 Simply Sensation is a solid white, maximum expressed, sabino overo with dark brown eyes. He is a good quality stallion with an excellent disposition, great natural gaits and champion breeding. He is a beautiful stout and stocky horse, a fun horse to ride with a natural foxtrot and great gaits. 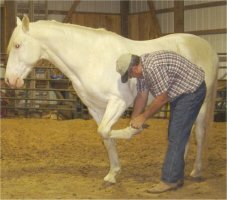 He is triple registered with the Missouri Foxtrotter, Spotted Saddle Horse and Pleasure Saddle Horse Associations. DAM: J.R.'s Sweetie Pie F.
Mack MauGray Midnight Mack K.